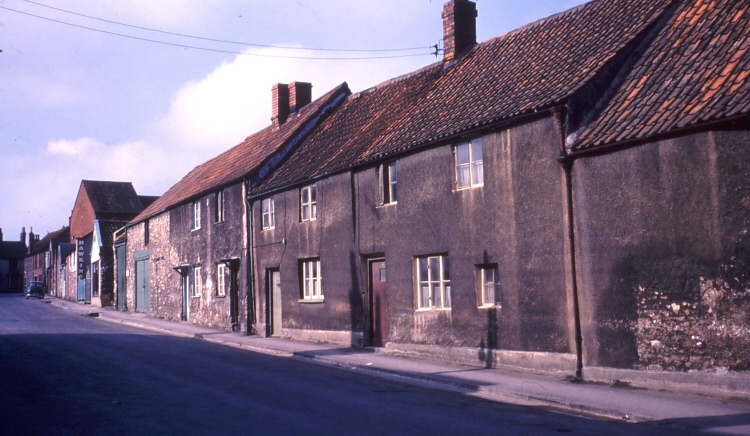 The photo above was taken in 1967 just before the row of cottages was pulled down. There were four cottages on the West side of the street, comprising two groups of two. The lower two cottages and the adjoining coach-house were owned by the Corporation of Thornbury and from the 1890’s by the Thornbury Town Trust, the other two cottages were privately owned. Further up the street you just see a sign outside Hawkins’s shop and the tall building with the pointed roof which is the back of Town’s cinema called ‘The Picture House’. The house which became number 8 was the house on the right with the brown door. The house on the left with the green door was number 10. The earliest reference we have of these houses is 1580 when they were given, with other land and property in Thornbury, by Thomas Slimbridge for the benefit of the poor of the Borough. They were thus vested in the Corporation of Thornbury and managed by the Mayor and the twelve aldermen of the town. It appears from the early records that there were three properties on the site. An indenture dated 2nd February 1656 shows that the ‘Trustees of the land some time of Thomas Slimbridge’ (then William Taylor the Mayor, John Baker, gentleman and John Bird, mercer) let out the property to Thomas Russell and his wife, Joan’. It was described as being ‘all that little decayed house or tenement as it is now divided wherein John Powell now dwells situate lying and being in a street called Saint Mary Street otherwise the Back Street lying between the house or tenement in the occupation of William Gayner and used as a Smithy Shop on the north part and the entry of the tenement there wherein Thomas Lydeatt dwelleth on the south part together with the yard court or outlet thereunto now or lately used by the said John Powell with so much of the said yard and backside and of the garden or plot of ground now or late in the occupation of the said Thomas Lydeatt‘. We suspect that it was the property referred to above is the one we are calling 8 St Mary Street which was then divided. The building shown on the far left in the above photo was ‘the shop’ used as a smithy. We have two indentures referring to this smithy describing it as being ‘at or near a place called Sopers Lane’ and the building shown above did stand on the corner of Soapers Lane and St Mary Street. We know from the Mayors Accounts Book that the Corporation still owned the houses in 1820 and we can trace most of their tenants since that time. In the 1840 Tithe Survey number 8 was Plot 166, a house, slaughterhouse and garden occupied by Joseph Walker. Number 10 was Plot 165 occupied by Benjamin English. Plot 167 was the coach-house and garden (next door to number 8) which was unoccupied at the time of the survey. In 1963 the Trust were informed that they could not let the buildings for housing purposes as they were unsuitable for habitation. The Trust sought alternative tenants who used the premises for storage purposes. In 1969 the houses were acquired by Thornbury Rural District Council under a compulsory purchase order as part of the Town Centre re-development. They were replaced by a modern shop unit now used by the Heart Foundation.